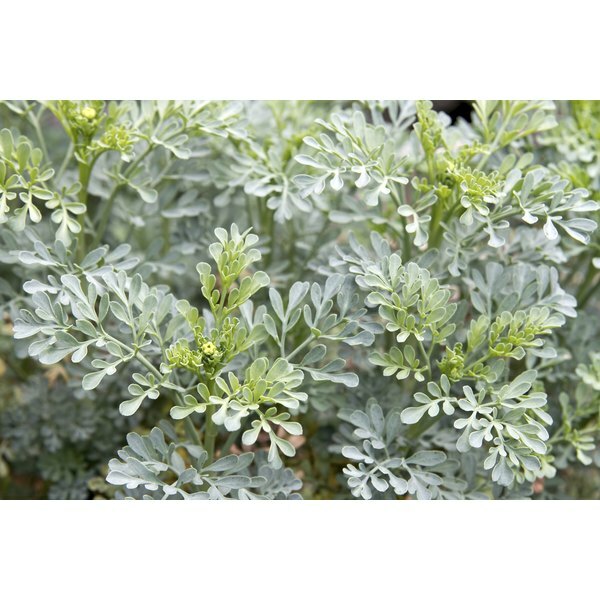 Ruta graveolens, also known as Herb-of-Grace and common rue, is an ornamental plant appreciated for its bright yellow flowers, which contrast with its velvety, bluish-green foliage. The plant is also valued as a culinary herb in Greek and Mediterranean cuisine. In terms of medicine, Ruta graveolens has historically been used to treat inflammatory conditions, menstrual disorders, parasitic infections and fever. Today, rue is more commonly used in homeopathy to treat bruises, sprains, varicose veins and rheumatism. The bitter leaves of rue are a traditional seasoning in many Mediterranean countries where it is used to flavor meats, fish, salads, sauces and egg and cheese dishes. In Africa, especially in Ethiopia, the fresh leaves are used to flavor coffee, while the dried berries and leaves are part of a classic seasoning mix called “berbere.” Rue is also used to flavor liquors. In fact, “grappa,” the national alcoholic beverage of Italy, incorporates rue leaves as a flavoring. Rue is cultivated as a perennial ornamental plant for borders and walkways. The flowers and leaves are gathered to add to nosegays and wreaths, or are pressed to make flower prints. Although rue imparts a pungent aroma, it is combined with other botanicals and used in the production of fragrances and cosmetic toiletries. It is best known as an aromatic additive to the fragrance oil of sweet pea, which is one of the few botanicals from which a true essential oil cannot be extracted. Ruta graveolens has several pharmacological effects. According to the “Physicians’ Desk Reference for Herbal Medicines,” the herb is antimicrobial, antispasmodic, photosensitizing and an abortifactant. John M. Riddle, author of “Contraception and Abortion from the Ancient World to the Renaissance,” mentions that rue contains an alkaloid called pilocarpine, which is used in veterinary medicine to induce abortion in horses. According to a paper published in the March 1995 issue of The Italian Journal of Neurological Sciences, it’s also the standard agent given to lab mice to induce epilepsy for the purpose of study and experimentation. On other hand, this alkaloid has a long history of successful use in treating glaucoma and is marketed under several trade names, such as Pilopine HS, Isopto and Diocarpine. Pilocarpine is also an antidote to atropine poisoning. Ruta graveolens should not be used during pregnancy due to the risk of miscarriage. In addition, the presence of furocoumarine increases photosensitivity, even following skin contact with the leaves. Is Cardamom a Stimulant Like Caffeine?